Today, the car rental industry has been growing day by day and the numbers of consumers, who have rented a car before, have been increasing sharply. For the growth in the car rental industry, services provided should be high-quality and consumers’ satisfaction and loyalty levels of these services should be at the high level. The main aim of this research was to examine the quality of the services in the individual car rental industry and analyze the effects of service quality on satisfaction and loyalty. The second aim of the study was to analyze whether car rental service quality differentiate based on demographics or not. Within these aims, data were gathered from 400 consumers, who have rented a car before, via face-to-face survey and e-mail survey techniques. Factor analysis, correlation analysis, regression analysis, independent sample T test, and Anova test were used in data analysis. In findings, it was seen that there were three dimensions of the car rental service quality scale, and the technical competence dimension affected both satisfaction and loyalty influentially. Also, it was found out that the technical competence dimension differentiated based on marital and education status of the customers. This study was an original study for focusing on the quality dimensions of services provided only in the individual car rental industry and examining these dimensions based on demographic variables. Günümüzde bireysel araç kiralama sektörü gün geçtikçe büyümekte ve araç kiralama faaliyetinde bulunan tüketici sayısı hızla artmaktadır. Bireysel araç kiralama sektörünün büyümesi için sunulan hizmetlerin kaliteli olması ve tüketicilerin sunulan ürün ve hizmetlerden duydukları memnuniyet ve sadakat seviyelerinin yüksek olması gerekmektedir. Bu çalışmanın ana amacı; bireysel araç kiralama hizmetlerinin kalitesinin incelenmesi ve hizmet kalitesinin memnuniyet ve sadakat üzerindeki etkilerinin araştırılmasıdır. İkincil amaç ise bireysel araç kiralama hizmetlerinin kalitesinin demografik değişkenlere göre farklılaşıp farklılaşmadığının incelenmesidir. Bu doğrultuda, nicel yöntemlerden anket tekniği kullanılarak daha önce araç kiralaması yapmış 400 tüketici ile yüz yüze anket ve e-posta yoluyla anket teknikleri vasıtasıyla veri toplanmıştır. Verilerin analizinde faktör, korelasyon, regresyon analizleri ve bağımsız örneklemler T testi ve Anova testinden yararlanılmıştır. Bulgularda araç kiralama hizmetleri kalitesi ölçeğinin üç boyutta toplandığı ve teknik yeterlilik boyutunun hem memnuniyeti hem de sadakati güçlü bir şekilde etkilediği görülmüştür. Ayrıca, teknik yeterlilik boyutunun tüketicilerin medeni durumlarına ve eğitim durumlarına göre de farklılaştığı bulunmuştur. Bu çalışma, sadece bireysel araç kiralama sektöründe sunulan hizmetlerin kalite boyutlarına odaklanması ve bu boyutların demografik değişkenlere göre incelenmesi açısından özgün bir çalışmadır. Individual car rental industry, Service quality, Satisfaction, Loyalty. Aldlaigan, A. H.ve Buttle, F. A. (2002) “SYSTRA-SQ: A new measure of bank service quality” International Journal of Service Industry Management, 13(4):362-381. Andaleeb, S. S ve Basu, A. K. (1994) “Technical complexity and consumer knowledge as moderators of service quality evaluation in the automobile service industry” Journal of Retailing, 70(4): 367-381. Atrek, B. ve Bayraktaroglu, G. (2012) “Is there a need to develop a separate service quality scale for every service sector? Verification of SERVQUAL in higher education services” Suleyman Demirel University The Journal of Faculty of Economics and Administrative Sciences, 17(1):423-440. Aydın, K. (2005) “Hizmet İşletmelerinde Servqual Yöntemi İle Hizmet Kalitesinin Ölçümü ve Kocaeli‘ndeki Seyahat İşletmelerinden Efe Tur Uygulaması” Sosyal Siyaset Konferansları Dergisi, (50). Aydın, K. ve Yıldırım, S. (2012) “The measurement of service quality with SERVQUAL for different domestic airline firms in Turkey” Serbian Journal of Management, 7(2):219-230. Babakus, E. ve Boller, G. W. (1992) “An empirical assessment of the SERVQUAL scale” Journal of Business Research, 24(3): 253-268. Bei, L. T. ve Chiao, Y. C. (2001) “An integrated model for the effects of perceived product, perceived service quality, and perceived price fairness on consumer satisfaction and loyalty” Journal of Consumer Satisfaction, Dissatisfaction and Complaining Behavior, 14:125-140. Bouman, M. ve Van der Wiele, T. (1992) “Measuring service quality in the car service industry: building and testing an instrument” International Journal of Service Industry Management, 3(4): 4-16. Bulgan, U. ve Gürdal, G. (2005) “Hizmet kalitesi ölçülebilir mi?” ÜNAK’05 “Bilgi Hizmetlerinin Organizasyonu ve Pazarlanması” 22-24 Eylül 2005 Kadir Has Üniversitesi, İstanbul. Caruana, A. (2002) “Service loyalty: The effects of service quality and the mediating role of customer satisfaction” European Journal of Marketing, 36(7/8): 811-828. Chang, K. ve Chelladurai, P. (2003) “System-based quality dimensions in fitness services: development of the scale of quality” The Service Industries Journal, 23(5):65-83. Cronin, J. J. and Taylor, S. A. (1992) “Measuring service quality: a reexamination and extension” Journal of Marketing, 56: 55-68. Çatı, K. ve Yıldız, S. (2005) “Şehirlerarası Otobüs İşletmelerinde Hizmet Kalitesinin Ölçülmesi ve Bir Uygulama” Hacettepe Üniversitesi İİBF Dergisi, 23(2):121-144. Devaraj, S., Matta, K. F. ve Conlon, E. (2001) “Product and service quality: the antecedents of customer loyalty in the automotive industry” Production and Operations Management, 10(4), 424-439. Ekiz, E. H., Bavik, A. ve Arasli, H. (2009) “RENTQUAL: A New Measurement Scale for Car Rental Services” Turizam: znanstveno-stručni časopis, 57(2): 135-153. Finn, D. W. ve Lamb Jr, C. W. (1991) “An evaluation of the SERVQUAL Scales in a retailing setting” Advances in Consumer Research, 18(1):483-490. Firnkorn, J. ve Müller, M. (2011) “What will be the environmental effects of new free-floating carsharing systems? The case of car2go in Ulm” Ecological Economics, 70(8): 1519-1528. Fornell, C. (1992) “A national customer satisfaction barometer: The Swedish experience” Journal of Marketing, 6-21. Frost, F. A. ve Kumar, M. (2000) “INTSERVQUAL–an internal adaptation of the GAP model in a large service organisation” Journal of Services Marketing, 14(5):358-377. Grönroos, C. (1984) “A service quality model and its marketing implications” European Journal of Marketing, 18(4): 36-44. Hair, J. F., Black, W. C., Babin, B. J., Anderson, R. E. ve Tatham, R. L. (1998). Multivariate data analysis. Upper Saddle River, NJ: Prentice hall. Hotamışlı, M. ve Eleren, A. (2011) “GSM operatörlerinde hizmet kalitesinin SERVQUAL ölçeği ile ölçülmesi: Afyonkarahisar örneği” ZKÜ SBE Dergisi, 7(13):221- 238. Jahanshani, A. A., Hajizadeh, G. M. A., Mirdhamadi, S. A., Nawaser, K. ve Khaksar, S. M. S. (2011) “Study the effects of customer service and product quality on customer satisfaction and loyalty” International Journal of Humanities and Social Science, 1(7): 253- 260. Kalaycı, Ş. (2010). SPSS Uygulamalı Çok Değişkenli İstatistik Teknikleri, Ankara: Asil Yayın. Kalkan, M. ve Yarımoğlu, E. K. (2016) “Dayanıklı tüketim malları sektöründe satış sonrası hizmet kalitesi ölçümü” Uluslararası Yönetim İktisat ve İşletme Dergisi, 12(30): 63-80. Karatepe, O. M., Yavas, U. ve Babakus, E. (2005) “Measuring service quality of banks: scale development and validation” Journal of Retailing and Consumer Services, 12(5):373-383. Koçoğlu, C. M. ve Aksoy, R. (2012) “Hizmet kalitesinin servperf yöntemi ile ölçülmesi: otobüs işletmeleri üzerinde bir uygulama” Ege Akademik Bakış, 29:1-25. Meijkamp, R. (1998) “Changing consumer behaviour through eco‐efficient services: an empirical study of car sharing in the Netherlands” Business Strategy and the Environment, 7(4): 234-244. Moeller, S. ve Wittkowski, K. (2010) “The burdens of ownership: reasons for preferring renting” Managing Service Quality: An International Journal, 20(2):176-191. Mont, O. K. (2002) “Clarifying the concept of product– service system” Journal of Cleaner Production, 10(3): 237-245. Oliver, R. L. (1981) “Measurement and evaluation of satisfaction processes in retail settings”, Journal of Retailing, 57: 25-48. Oliver, R. L. (1999) “Whence consumer loyalty?” Journal of Marketing, 63:33-44. Owlia, M. S. ve Aspinwall, E. M. (1996) “A framework for the dimensions of quality in higher education” Quality Assurance in Education, 4(2):12-20. Özdamar. K. (2004). Paket Programlar ile İstatistiksel Veri Analizi, Eskişehir: Kaan Kitabevi. Parasuraman, A., Zeithaml, V. A. ve Berry, L. L. (1985) “A conceptual model of service quality and its implications for future research” Journal of Marketing, 49(4):41-50. Parasuraman, A., Zeithaml, V. A. ve Berry, L. L. (1988) “SERVQUAL: a multiple-item scale for measuring consumer perceptions of service quality” Journal of Retailing, 64(1):12-40. Parasuraman, A., Zeithaml, V. A. ve Malhotra, A. (2005) “ES-QUAL a multiple-item scale for assessing electronic service quality” Journal of Service Research, 7(3):213-233. Sangeetha, J. (2012) “Development of a service quality scale for multiple technology interfaces in commercial banking” Journal of Internet Banking & Commerce, 17(3). Saravanan, R. ve Rao, K. S. P. (2007) “Measurement of service quality from the customer’s perspective–an empirical study” Total Quality Management and Business Excellence, 18(4), 435-449. Sipahi. B., Yurtkoru. E. S. ve Çinko. M. (2006). Sosyal Bilimlerde SPSS’le Veri Analizi, İstanbul: Beta. Sivadas, E. ve Baker-Prewitt, J. L. (2000) “An examination of the relationship between service quality, customer satisfaction, and store loyalty” International Journal of Retail & Distribution Management, 28(2):73-82. Stevens, P., Knutson, B. ve Patton, M. (1995) “DINESERV: a tool for measuring service quality in restaurants” The Cornell Hotel and Restaurant Administration Quarterly, 36(2):5-60. Uğur, S. (2014) “Kullanım Odaklı Ürün-Hizmet Sistemlerinde Talebe Etki Eden Faktörlerin Değerlendirilmesi ve Örnek Sistem Tasarımı” Basılmamış Yüksek Lisans Tezi, İstanbul Teknik Üniversitesi Fen Bilimleri Enstitüsü, İstanbul. Wong, A. ve Sohal, A. (2003) “Service quality and customer loyalty perspectives on two levels of retail relationships” Journal of Services Marketing, 17(5):495-513. Yarimoglu, E. K. (2017) “The Links among Quality, Service Recovery, Value, and Loyalty on the Internet” in Strategic Innovative Marketing (pp. 265-271). Springer International Publishing. Yılmaz, V., Filiz, Z. ve Yaprak, B. (2007) “Servqual yöntemiyle yükseköğretimde hizmet kalitesinin ölçülmesi” Anadolu Üniversitesi Sosyal Bilimler Dergisi, 7(1):299-316. Zeithaml, V. A., Parasuraman, A. ve Malhotra, A. (2002) “Service quality delivery through web sites: a critical review of extant knowledge” Journal of the Academy of Marketing Science, 30(4):362-375. ISNAD ŞİMŞEK, Mehmet , YARIMOĞLU, Emel . "Araç Kiralama Sektöründe Hizmet Kalitesi, Memnuniyet ve Sadakat İlişkileri". 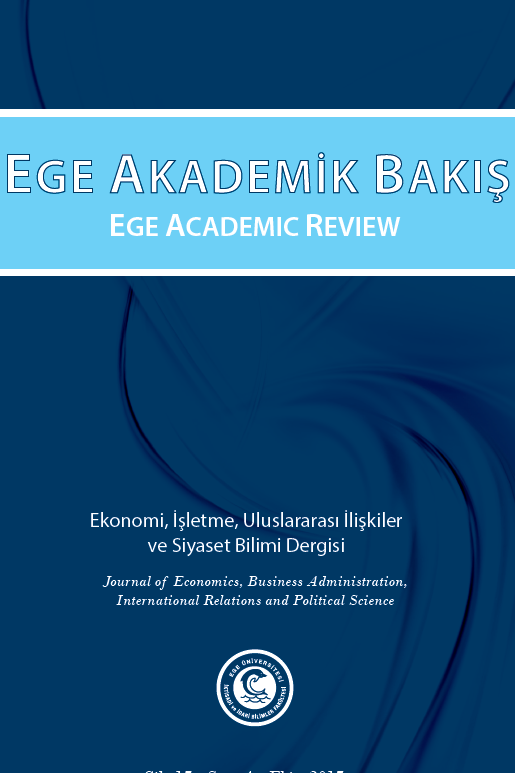 Ege Academic Review 19 / 1 (January 2019): 89-101.